I am starting this blog with a certain amount of apprehension, as I know that keen followers of golf will have already made up their minds about the way that the USGA dealt with the contentious Rules situation that arose during the final round of the US Open in Oakmont Country Club, Pennsylvania last Sunday. If you have not read the USGA statement of the circumstances surrounding the way that Dustin Johnson (DJ) was advised that he may have incurred a penalty and the subsequent imposition of a penalty stroke after all players in the competition had completed their rounds, then I suggest that you do so before continuing to read this blog. It certainly clarified some of the issues that I had, which means that it is no longer necessary for me to explain them. I am copying the USGA statement for your convenience at the end of this blog. A player has ‘addressed the ball’ when he has grounded his club immediately in front of or immediately behind the ball, whether or not he has taken his stance. So, DJ definitely did not address his ball, but the videotape clearly shows that he grounded (or soled) his putter to the side of his ball, brushed the grass twice with practice putts, grounded his club again and then hovered it immediately behind his ball, just above the grass, withdrawing it quickly when he saw that his ball was beginning to move off its spot. You can view this sequence of events and hear the explanation of Jeff Hall, Managing Director, USGA Championships, at this Fox Sports link following the advertisement. So, nobody doubts that the ball moved, the question is did the weight of evidence indicate that it is more likely than not that DJ caused his ball to move, even though that conclusion is not completely free from doubt. The factors that have to be taken into account when arriving at a conclusion are set out in Decision 18-2/0.5, which is too long for me to reproduce here, but can be viewed on-line at this link. In my opinion, it was more likely than not that DJ did cause his ball to move by disturbing the grasses next to his ball creating a domino effect whereby grasses that were under the ball were moved, resulting in the ball settling into a different spot. It is interesting to note that in similar circumstances during Saturday’s play, Shane Lowry called a penalty on himself and replaced his ball, admitting that he had caused it to move slightly, even though he did not touch it with his club. (Edit 4th July: If you think that the Ruling Bodies were unduly harsh on DJ take a look at this incident of him causing his ball to move when he was not assessed a penalty, because it was ruled that his ball settled back to its original spot). One point that other reporters do not seem to have picked-up on is that when the referee asked, "You didn't ground your club [did you]?" DJ replied, "No". When it became obvious to those reviewing the videotape that he had, it surely worked against him. I am not suggesting that he was lying; he probably thought that the referee meant, did he address his ball, but his answer to the question asked was clearly wrong. The reason why the distinction between addressing the ball and grounding the club is so important, is that for four years prior to January of this year there was a Rule, part of which stated; If a player's ball in play moves after he has addressed it (other than as a result of a stroke), the player is deemed to have moved the ball and incurs a penalty of one stroke. The reason that I have greyed this is that this Rule 18-2b no longer exists, which presumably had escaped the attention of TV commentators and some Pro golfers who jumped in to criticize the USGA, using the lack of address as to why there was no penalty. The same overall test as to whether a player has caused their ball to move (in Rule 18-2) now applies to all actions by a player anywhere on the course, whether they have addressed their ball, or not. My guess is that because the referee accepted that DJ had not caused his ball to move he had tacitly approved that the ball did not have to be replaced, which is the case if the player has not caused their ball to move. Therefore, it would have been inequitable to impose the additional penalty stroke and I certainly agree with that, although I would prefer that it had been properly explained. (Edit 22nd June, 2016: It has now been pointed out to me that Decision 34-3/7 deals explicitly with this situation). 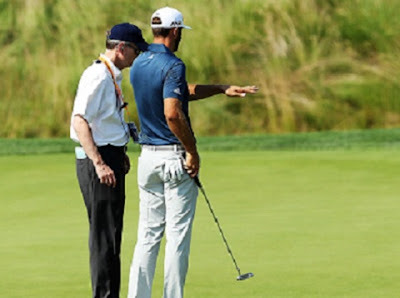 Finally, on the matter of whether players should be informed that they may have incurred a penalty whilst continuing their round out on the course, which is the point that seems to have enraged most viewers of this engaging, US Open final round. It seems an easy decision on the face of it; make a snap judgement as to whether a penalty was incurred, telling the player if the ruling goes against them and reflecting it on the scoreboard; or ignore the fact that there may have been a breach and let the players get on with it. In the former scenario, the player, their fellow competitors, caddies, even spectators, are not given a chance to provide evidence on the matter in question; in the latter case, the rights of every other competitor in the field are effected, if it subsequently is proven that a breach had occurred. There is no perfect solution. The Rules have evolved to where they are now with the accumulated experience of more than 250 years of competitive golf. Far from being ‘amateurs’, which is an accusation made against them by many who should know better, those engaged with USGA and R&A are golf enthusiasts, who work tirelessly to ensure that competitors in golf competitions, wherever they are played, at whatever level, are playing to the same Rules. P.S. I do not intend to engage in lengthy discourse with readers that disagree with my opinions on this matter, but I will post any comments that add to the discussion, providing they are reasonably expressed. The second ruling, that DJ had caused the ball to move, was correct. The first ruling, at the time of the incident, was incorrect. Had the official making the first ruling, that DJ did not cause the ball to move, asked if the putter was grounded, he could have made the correct ruling on the spot and avoided all the hoopla. Hello Barry! I love this blog! Can you please comment on the application of rule 34-2 "Referee's Decision"? It's my thought that the referee's decision would have been final unless DJ requested an appealed to the Committee. Is this the proper application of this rule? The referee's ruling was upheld in respect of him saying that the ball couuld be played from where it came to rest. However, he made his ruling about the ball moving on the incorrect statement from DJ that he had not grounded his club. The videos clearly show that he did ground his club, twice, so the ruling was based on the wrong facts given to him by the player. Rule 34-2 means that the player has no right to appeal the referee's ruling, but it does not stop or prevent a Committee from correcting an incorrect ruling. I guess that decision 34-3/7 explains why he got one penalty shot, and not two? Thanks Barry for a very reasoned discussion. In your opinion should the usga change anything about rule 18-2 or would you rather not get into that? You guessed it! I prefer to interpret the Rules as they are and not involve myself in how they could/should be changed. The tournament leader(s) seem to be at a disadvantage in such rulings as their actions are certain to be caught on video. A similar circumstance could have, and likely did, occur for a golfer playing earlier in the day, but may have not been captured on video. If the same level of scrutiny can't be applied across the field it seems improper to apply only to a few. Perhaps if video evidence can't be reviewed for all golfers, it shouldn't be reviewed for any. As I have said before, if a player is not penalised for a breach that is obvious to TV viewers they will forever carry a stigma that they 'got away with it'. This is particularly true if they go to to win a tournamemnt. Once an action has been recorded on camera it cannot be undone. Understand the decision now of not penalising DJ 2 strokes for not replacing ball etc.. many thanks. Staying with The US Open and Dustin Johnson, but on another observation. When DJ took relief from TIO and Line of Play/Sight during play of hole 10,a situation that we amateurs would not regularly come across,he appeared to drop his ball within 2 club lengths of his Nearest-point-of-Relief, which was in the rough. Is there a different allowance for professional tour golfers e.g. 1 club length and stance and dropping within that distance or is there another explanation? The permitted relief depends on the exact wording of the Local Rule for TIOs on the USGA hard card, which I do not have access to. Relief from TIOs is a complicated area, but you can be assured that the officials on any holes with TIOs will have been well instructed on the relief that is available without penalty before the competition started. Many thanks Barry, assumed it might come down to 'local' rules as I could not find any explanation otherwise. Re DJ and Moving his ball, I note that Decision 34-3/7 has been mentioned, but would not Decision 34-3/8 apply in the fact that DJ's version of the facts were found to be incorrect? In view of DJ not providing the correct facts would not decision 34-3/8 have be more appropriate? I am sure that the USGA reviewed all the evidence and subsequently ruled that Dustin had no intention of misleading the official. Thank goodness! In my opinion, the referee did not ask the right questions to ascertain the full facts. I would love to hear your explanation of the mechanism, within closely-mown and rolled poa annua turf, which would cause this phenomenon to occur. Maybe an agronomist or a turf expert can weigh in? domino effect of grass is a new one to me. more likely than not the ball would have moved anyway even if dj was nowhere near. Excellent summation of the incident Barry, I too felt they got the decision right in the end due to the grounding of the club, but trying to explain the situation to those who have asked my opinion has been challenging to say the least. I will refer these people to your blog which explains everything very succinctly. I felt the decision should have been made in a more timely manner. In my opinion the need for all players who might be affected by the decision to know where they stood in the closing stages of the tournament far outweighed the need to allow DJ to provide input into the decision. Players are not normally given this opportunity as a rule in my experience where the evidence is pretty clear (as it was in this case). 1. The direction that the ball moved in was at right angles to the direction that the putter was grounded. If grounding the putter is likely to have caused the ball to move then shouldn't we expect to see the ball move either directly towards or directly away from the putter? 2. The movement was far from being 'almost immediate' as the USGA stated. DJ grounded his putter once, the ball does not move. DJ takes two practice strokes, the ball does not move. DJ grounds his putter a second time (in the same spot), the ball does not move. DJ lifts up his putter, the ball does not move. It is only after DJ moves his putter to a position behind the ball (in the air) that the ball starts to move. If grounding the putter was the cause then the movement should have happened much sooner. 3. DJ goes through the exact same pre-putt routine over 1,000 times a year on the PGA Tour and the never causes the ball to move, and in that very tournament on those same greens he had been through that routine more than 50 times without causing the ball to move. What was different in his routine this time that caused the movement? Did he put more weight on the putter? Was he closer to the ball? Did he accidentally stub the ground in an practice swing? 4. DJ's ball was resting on a downslope on greens cut and rolled to be as quick as possible and therefore create as little friction as possible. All week we saw balls almost stop, or even completely come to rest, and then suddenly start to move again and even pick up pace. It is therefore very possible that when DJ replaced his ball after marking it was actually sitting in a slightly unstable position and slowly gravity caused it to shift due to a lack of friction preventing it from moving. That movement could have happened whether DJ was standing over the ball or was crouching 4 feet behind the ball reading the line of his putt. Personally I think that there was enough doubt to say that the probabilities were less than 50%. But I also agree that the rule and decision allows the USGA to decide differently. I would also be keen to know what actions they took to decide how likely it was that he caused the movement. Did they walk out and inspect that green in that spot to assess the slope angle? Did they look at previous putts that DJ made to judge if he did anything differently? Did they ask for another camera angle that better showed how close DJ's putter was to the ball when he addressed it? Or was this decision made entirely by looking at one zoomed in camera angle from the TV footage? It also seems to me that the USGA/ R&A made a mistake when they changed the rule recently. Under the old rules DJ (or any other player for decades before) would not have been assessed a penalty as he had not addressed the ball, but that rule was changed as it was deemed unfair that players could be penalised when outside influences (such as strong winds) could cause the ball to move completely beyond the player's control after they had addressed the ball. I very much doubt that the intention of the rule makers was to be able to penalise players who before would have been protected by not addressing the ball, so the change in the rule has actually created new problems while solving others. Maybe the rule should be amended again to say that the player cannot be deemed to have caused his ball to have moved until after he has addressed it (as before), but adding the protection regarding outside influences causing the movement. While I respect your opinion you do take a lot of liberties in how/why/affirming the ruling. 1.) You should edit the article and include the fact that Shane Lowry actually dressed his ball and grounded his club directly behind the ball. A point conveniently left out. 2.) If you search the internet one could find many angles of how DJ practice stroke and addressing his ball as he putts (he usually performs his practice strokes 3-5 inches away from the ball). The video provided in a 2D format you/we are suffering from severe parallax error and optical illusions are taking place. One could not conceivably come to a reasonable conclusion on whether grass domino effect caused his ball to move. 3.) This "grass domino effect" is not a very scientific explanation on how it "possibility" could have happened and is misleading at best. Given the mowed grass height & rolling, maybe 1 or 2 adjacent blades could have moved but without any experiments it would be impossible to know. 4.) The problem with the rule is people are being penalized for penalizing sake...Just in case. There is more than enough evidence to prove more than a 51% that something else could have caused the movement. At the 14+ stimped green speeds, gravity, lack of friction, wind ....anything could have moved that ball. A lawyer who is an ambulance chaser would have a field day disproving the ferry picked claims by the USGA. 5.) Finally by penalizing DJ they are in essence calling him a lier. A gentlemans game, based on honor. If I were DJ I would have signed for what I thought I made on the hole and dared the committee to disqualify me....And then have the stones to go explain to the world why then disqualified the true winner. This entire fiasco is of the USGA doing....From the poorly written rule, its poor interpretation, the cluster of the application of the poor interpretation and finally the half hearted "apology" the next day. To bad it was not on the 8th hole, he could claim a semi truck was driving by and caused his ball to move. It will be interesting if this situation causes a rule change in two or four years. Think ball resting in long grass, rescue club grounded one inch behind it, which then settles deeper into the rough, as a direct consequence. The USGA have admitted that they need to review how to impose a penalty in these circumstances. A problem that they face is to avoid the intimation that they do not believe the information that the player has given them, without providing them with an opportunity to view the videotaped evidence. We will have to agree to disagree about whether DJ caused his ball to move. However, I must correct you on your last paragraph, as it seems that you may have misunderstood the changes to Rule 18-2 in 2012 and again in January of this year. It has always been the Rule that a player incurs a penalty if they cause their ball to move, the difference was whether they had addressed their ball, or not. As it stands, the weight of evidence as to whether the player has caused their ball to move, as set out in Decision 18-2/0.5, is now the same wherever their ball lies on the course. I love and respect your column, but I have to agree with others that your "domino effect" causing the ball to move makes absolutely no sense to me. Your response to rj b equating it to a ball resting in long grass, at least to me, is a completely different situation. In the long grass case you could envision the adjacent grasses either helping to support the ball and/or enmeshed with the grasses underneath the ball. However at Oakmont the individual grass blades were roughly .07 inches (1.78mm) at their green speeds (see http://gsrpdf.lib.msu.edu/ticpdf.py?file=/1990s/1997/970312.pdf). To intertwine/domino such short blades of grass over the distance between his putter and the ball seems improbable. A more likely case could be made that the vibration caused by the gentle grounding of his club cause the ball to eventually topple. Whether that is a course's reasonable condition of play I will leave to others. Given the conversation between DJ and the referee, DJ should have been assessed a two shot penalty under Rule 18-2. Decision 34-3/8 covers this exact scenario. This error has been overlooked in the discussion about the USGA's decision as to the cause of the ball's movement. If DJ caused the ball to move, Decision 34-3/8 should have taken effect and DJ should have finished at -3. I understand your point, but the USGA made their ruling under Decision 34-3/7. Presumably they thought that DJ deserved the benefit of the doubt when he gave the wrong information to the referee on grounding his club because he misunderstood what he was being asked. He then received permission from the referee to play the ball from where it lay. What is the origin of this rule, and what is its purpose? This rule may have been put in place when grass was mowed with a push mower at a quarter of an inch. Getting your ball to stay in place in shag carpet is much easier than a tile floor. Greens mowed at less than an eighth of an inch and rolled with heavy machines obviously will provide much less friction than the greens of just 20 years ago. This rule may have been pushed right to the edge of its effectiveness by modern greens mowers and rollers. Perhaps an easier, and less subjective rule is needed. Rule 18-2 has been in the Rule books at least since 2000 and probably a lot longer. What has changed is that a player is no longer 'deemed' to have moved their ball in certain circumstances, there must be 'weight of evidence' (as ruled in Johnson's case) that the player caused their ball to move. USGA: I serve on the Rules Committee for the Metropolitan Amateur Golf Association in St. Louis and have officiated at many USGA qualifiers. Here are some thoughts on the situation that occurred on Hole #5 on Sunday with Dustin Johnson. What happened on Sunday was, in my opinion, an unintended consequence of the January 1 changes in the Rules. I also think that with video-replay having changed the landscape for other professional sports (football, baseball, etc. ), it is a shame that there is not a mechanism for resolving these issues in golf in a timely manner. One way would be to empower a referee in golf to make the final decision in specified situations without undue delay, even if, for example, video evidence should later show something like a ball moving a fraction of a millimeter. A few questions asked of the player involved and his fellow competitors (who have a vested interest in the outcome of a ruling and are responsible for protecting the field) at the time of the incident could be appropriate, and such a limited investigation would be timely. In this case, I suspect that, absent the video, Dustin likely would not have been penalized. I suspect that you have been bombarded with lots of comments. I look forward to hearing the results of your assessment of procedures and your announced intention to "have a better process." All reference to grounding the club is perhaps as unhelpful as reference to addressing it. The USGA say the ball moved 'almost' 'immediately after' the club was grounded because it was not immediately after. It is just as likely in my view that the swoosh of the putter so close disturbed the air around the ball and had a more immediate effect. We know the greens were glassy. A better question by a match official may be 'Is there any possibility that you or your equipment may have inadvertently caused that ball to move?' Also to others who saw the incident. I don't recall seeing a ball move due to wind alone that afternoon. Another prudent measure may be to take the greens down a notch or two on the stimpmetre next time - less of a headache for the players and the USGA! Barry, I appreciate your thoughtful and measured response, but to me it all comes down to which side of the 50% line you place your chips. I happen to think DJ's actions did NOT cause the ball to move in the direction it moved. I would love to know which way the ground sloped, but I still think the grass could have "unbent" on its own, within that time frame. I believe the committee made their decision out of consideration for Lowry's self-imposed penalty on Saturday. NOT penalizing DJ might have created an even bigger PR fiasco, if DJ had won by one stroke. Anonymous, I disagree that asking a player the question, "Is there any possibility that your actions may have caused the ball to move?" would clarify things. I think most of us agree that it's POSSIBLE, and so we would have to answer "Yes." However, under the current rule the question is whether or not it is probable (more than 50/50). That might be a better question. This whole thing seems like a terrible setback for golf, but I'm hopeful it will result in slowing down ridiculously over-the-top green speeds at the pro level, which may trickle down to amateurs and even us hacks. Actually I play on exceptionally slow greens and I enjoy the crazy contours they allow. Barry, I believe Rule 18-2 and related Decisions should be changed to avoid the Oakmont fiasco and to simplify the Rules. At a minimum, when on the putting green, a ball at rest that subsequently moves would simply be replaced with no penalty to the player if he did not move or purposely cause the ball to move. This could involve considering gravity and wind as outside agencies for purposes of Rule 18-2 when a ball is at rest on the putting green. More extensively, I would also extend this change to the entire golf course. Finally, I would consider eliminating penalties for other certain other direct but accidental movement of balls by the player or his equipment and simply require replacement of the ball understanding that this final measure would involve more complexity than the Rules bodies would be willing to take on. Slugger White, the head rules official with the PGA Tour, believes that the rules should be changed so that if the ball moves for any reason, anywhere on the course, before address, after address, by wind or water etc., it should be replaced and no penalty should be assessed. What are your thoughts Barry? In principle, I do agree with this suggestion, which has often been made. However, as with any changes to the Rules that have taken 250 years to evolve, there could be unintended consequences that lead to complicated exceptions/refinements to what seems to be a simple matter. For example, a player sees that there is mud on the side of the ball that they want to strike. They drop their club 'accidentally', or ground their club heavily in the long grass on which the ball lies, causing their ball to move. Should they be able to replace the ball with the mud on the other side, without incurring a penalty? The opinions on this subject are fascinating. It is also fascinating how people conflate fact with opinion, and how once this leap is made, no argument to the contrary can hold sway. The key question is quite simple: Did Dustin Johnson cause his ball to move or not? The FACT is, we cannot say for sure. We can devise any number of theories on what might have produced the movement, and we can debate the relative merits of each theory, perhaps even to the point where one single theoretical construct seems most likely. But that does not make it CERTAIN. There are plenty of instances in life where a “most likely” cause turns out to be inaccurate when new evidence is obtained, so I wouldn’t recommend getting overly comfortable with one’s preferred opinion, no matter how likely it seems. In this case, we cannot say with certainty what caused the ball to move. We simply don’t know, and we will never know. However, if we can embrace this reality, it may actually point us towards a mechanism for obtaining more satisfying outcomes when similar circumstances inevitably arise. USGA Decision 34-3/9 contains the following snippet: “In some situations where the facts are not decisive, the doubt should be resolved in favor of the player (Decisions 15-1/2 and 19-1/4.1); in others, the doubt should be resolved against the player (Decision 13-4/35.5 and 21/3).” For me, this is the crux of the Dustin Johnson problem, and unfortunately the guidance provided by these decisions is in conflict with itself. Thus, perhaps a definitive rule stating that “In cases where the facts cannot be ascertained with certainty, the doubt should be resolved ______________ the player.” would be in order. Then we can simply debate whether the blank should be filled in with “in favor of” or “against”.